Part of doing right, is cutting out the big agri-food machine that is killing people, the soil, and the atmosphere. 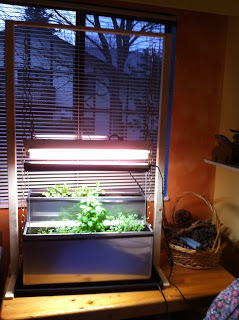 In this week’s program, we’ll consider a late winter remedy: growing food under lights. Our guest is Philip Be’er. We start with a show and tell experiment right here in the Radio Ecoshock studio. Later I’ll pass on tips from my own career under the lights, plus a conversation with small-scale, low-tech farmer, and anthropologist, Walter Haugen. We begin with a slice from an ode to the beat poet Neil Cassady, from the Australian band Pagan Love Cult. At the end of this show, you’ll bet their full song “Everything I Know”. Sun glasses on. Flick the switch. This is radio that grows. My opening guest in the studio is Philip Be’er, owner of Home Harvest Farms in Vancouver, Canada. His company makes durable and portable container garden equipment. Philip also teaches sustainability, so we go beyond business, to talk about our general food supply, and why learning to grow your own makes so much sense these days. The web site is homeharvestfarms.com. I ask Philip to describe some of the products he sells, many of which he invented. You see, Philip began as a technical support person on a Kibbutz farm in Israel. As an aside, his farm developed a technique for pasteurizing vegetables (not milk, veggies!) using only hot water. It keeps them alive much longer, but Philip says although the technology is widely used and successful in Israel, it has not emerged in Europe or North America yet. That may be an opportunity for someone. Be’er has developed stainless steel growing boxes that are deep enough to get good roots. These can be mounted on carts he provides, so you could wheel your plants out when it’s sunny and warm enough, and then indoors at night, or during cold weather. Supplement the outdoor light with fluorescent grow lights that use very little energy (see my notes below). I bought the mini model, suitable for a condo table-top garden for kitchen herbs and lettuce. In another suprising development, Be’er found that many urban gardeners end up having to move their planting area within three years. Perhaps that free lot is being built-over, or the person moves to another part of the city. Rather than losing all the work they put into developing soil, Philip offers portable growing boxes. These can be moved on a pickup truck for example. You could even move your whole growing box, plants and all, to a new location. You can watch Philip Be’ers new video on You tube “One billion news jobs … what we are not being told!” right here. And here is his Facebook page. The kitchen grow-box I bought from Philip Be’er. Note the home-built light stand, with the duller flourescent in the background. You can’t see much of the brighter new T5 fluorescent – because the reflector is pointing all that light straight down at the plants. You can see the basil and oregano in front, with a new planting of two cilantro plants in the back. These are transplants, just 5 days in the box. In my mind there is a hierarchy of home agriculture. First and foremost, we do most of our gardening under the sun, as Nature intended it. That’s where most of your growing should happen, whether it’s on your city lot, or pots on the patio. Second, we grab the harvest when it’s there. Get the book “Putting Food By” to find out how in detail, for every kind of food. Freezing has it’s place, especially for the berries, but I still prefer drying food, and canning the rest. That way we don’t depend on the grid, or use still more fossil fuels, just to keep our food over the winter. For the root crops, anybody with a yard can build a root cellar, or use a basement to store that harvest plenty, when prices are cheap, and local food abounds. Only after that, or in unusual circumstances, would I supplement the real solar harvest with food and herbs grown indoor under lights. It’s super legitimate to get seeds and seedlings started early in the spring under a few fluorescent bulbs. Speaking of that, I dragged out my old 24 inch two bulb fluorescent grow lamp from 15 years ago, to compare it to the new model Philip Be’er brought me. There has been a ton of progress in fluorescent grow lamps, mainly due to stimulation from the multi-billion dollar pot industry. My old fluorescent lamp is big, it has a ballast noisy with a hum, but the main difference is the lack of pure sun-like brightness. The old fluorescents, with 8 watts per bulb, look pale and pasty, compared to the T-5 Sumblaster I got from Philip. That’s a single bulb, 24 watts in the 24 inch model. It doesn’t hum, is slim and light weight. The T5 comes from a company called “Future Harvest Development” which has a web site here. FHD only sells wholesale, you have to look up your local dealer for their products. Adding the optional “Nanotech T5 Reflector” forces all the light downward toward the plant. Just eye-balling it, this unit is far brighter, in the spectrums that count, than the old fluorescent grow tubes you may have seen a few years ago. It runs cool too, meaning you can get it closer to the leaves, where it needs to be. One 24 inch light, with an on-off switch, sells for $32 in Canada. The reflector is another $20. You could make your own out of aluminum foil, but I like the reflector that fits the unit well. My only beef with the low-end unit I got from Philip at Home Harvest Farms is the wire supports meant to hold up the light aren’t reliable. They are just poked into the soil, and when that soil shifts, the light can fall down. I built a light stand using one 2 by 2 and a 1 by 1, both eight feet long, plus 8 screws and one metal “L” bracket. That way I can use cheap chain to raise and lower the lights as the plants start out or grow. Future Harvest also sells a light stand for the T5. It looks better, but I don’t think it would extend high enough for the deep trays Philip provided. My first intention was simply to have some fresh herbs for the kitchen when cooking. In that scenario, you hope the herbs will grow enough that you can pick them without killing the plant. You are NOT trying to get them to flower, and you don’t want them to go to seed. What if I did want to grow some lettuce, and then save the seed? Or even a small bush mini-tomato plant? When the plants were mature enough, I would have to change the light-bulb in the fluorescent. Most plants depend on subtle light signals to fruit or bloom – the kind of redness in the sky that happens later in the season. The normal “vegetative” bulb in my unit is rated at 6400 K. That’s “K” stands for Kelvin. It’s a standard way of measuring the mix of light waves, known as the color temperature. Look it up in Wiki. To stimulate fruit and bloom, I would change to a color temperature of 2700 K. That’s more reddy orange. You would have to order that from a local dealer. LED grow lights are storming into the scene. There’s a lot of debate among indoor growers about how well they work, but some swear by them. I haven’t tried LED grow lights (yet) but apparently just red and blue lights will grow plants. You can end up with strange science-fiction-like scenes, where plant leaves under lights look rather black, and the whole room looks like a bad acid trip. Remember, plant leaves only look green because that is the frequency they DON’T need, the color they reject. Green lights wouldn’t grow anything. Still… as you can see in the videos below, LED grow lights work, and have several advantages: (1) they run much cooler, reducing the need for a lot fans, ventilation and noise (2) the bulbs are not cheap, but last for years and (3) they use far less electricity (and so produce fewer greenhouse gas emissions). Plus, there is no mercury or heavy metal problem with this lighting system, as there is with CFL’s (compact fluorescents). Yep, its the “Volksgarden” (truly “revolutionary”) a rotating hydroponic system. Yes, lettuce and tomatoes grow with their roots upside down and moving! It’s $2600! From Omega Garden, in Qualicum Beach, British Columbia. But its a sales video – read the comments below too! Using their lighting type comparison, the LED’s use far less power than a standard HID big bulb (say 600 Watts). If run continuously over a year, their 400 Watt LED would use almost $400 less power (at 12 cents a KWH in B.C.) instead of a 600 Watt HID (which issues comparable light). There are also compact fluorescent grow lights (CFL). Use 2700 Kelvin for flowering. They run very cool, can even be touched by hands. Or just try the 6400 K “daylight” bulbs for vegetative growth, like lettuce or herbs. Note one blog comment: these CFL lamps only emit plant-growing light from the SIDE of the bulb. Hanging them upside down over the plants will deliver very little useful light to the leaves. The CFL bulbs need to be mounted horizonally. As soon as I set up my little grow box in the studio, I noticed other changes. When you transplant basil, its aroma fills the room for several days, until it settles down. I hope you like basil. Next the cat showed up. She did not nibble any leaves, these were not on her menu. But kitty likes to lay down in front of the planter, under the fake sunlight, on a dreary day. Sooner or later some unwelcome insects will find my kitchen garden. They always do. I’ll have to have some non-toxic insecticidal soap on the ready for the aphids. Of course having some extra sunlight in the room adds some cheer. I’ve got the lights on a timer, running 16 hours, with 8 hours of darkness. That has worked well for me in the past, but if you have better info, let me know. More than a dozen years ago, I did some indoor gardening for about a year. That was therapy really, as I recovered from two operations on my spine. I couldn’t get outside, but still wanted to “get my hands dirty” (without growing pot!). Due to my disability, we had to rent in a poorer part of town. A neighbor pot grower suddenly had to leave his set up, and was selling off grow lights very cheaply. I bought three: two 1,000 watt metal halide lamps (huge growing power!) and one 600 watt lamp. We painted a spare room white and set it up to grow veggies and even a few ornamentals. It was a lot of fun, and good for my health. Therapeutic gardening is a whole other topic – we could spend an hour just on that! But now I’m looking at vegetative plants, like herbs and salad fixings. I bought some small herbs in tiny pots, already growing, to stock up: two of cilantro (we are Pesto fans here), a basil plant, two oregano, and one thyme. The rest of the planter will go to heirloom lettuce, likely with either very dark or colored leaves, started from seed. We’ve already harvested some basil for a home-made pizza – it was really flavorful. But what if I want more, like the holy grail of indoor gardeners, the tomato. Frankly, tomato plants are over-rated for the watts they consume. Why not plant things like beets, where you can eat the roots and the tops, instead of throwing out most of the plant? If you want tomatoes, you need more serious lights, in my opinion. A 600 watt bulb would do one plant, or maybe a 330 watt LED light. A thousand watt bulb would grow several large tomato plants. Again, you would have to buy a thousand watt fruiting bulb, at 2700 K, to make it happen. The electricity expense will never justify the cost of those tomatoes. But you can get fresh heirloom tomatoes when they are ripe, in December or any time. Perhaps if we subtract all the fossil-based fertilizers and insecticides you didn’t use, the tractor fuel, and the trucking emissions to bring them north, the carbon cost might even out. If you know anyone who has done these calculations, please write me. The address is radio at ecoshock.org. As I said, I wouldn’t take on the big lights at all if your electricity comes from coal or nuclear fuel. Could you grow with solar power? Certainly you could, using these modern high-powered fluorescents. The four foot long bulbs put out 54 watts of power. That’s twice as bright, without using a lot of juice. You might still need either wind power, or the grid to back you up after a week of cloudy, rainy weather. Growing plants indoors requires dependeable light, every day. Otherwise the plants can stall, and you lose more than just a day or two of growth. Commercial greenhouses use the lights every day without fail. It mainly depends on where you live. If you are in a sunny region, I’ll be you could be growing, even during the cold times, using a combination of a skylight or greenhouse, supplemented with fluorescent grow lights. Please let me know your experiences. Before we get to our next guest, Philip Be’er brought up one scary point. The real bottleneck to the new local food movement might be seeds. What if we are too successful? Could the non-GMO seed houses keep up? What if a stock-market crash convinces millions of people to tear up their lawns and plant. Will there be enough seeds? I posed this question to Chris at The Incredible Seed Company, a Canadian outfit the provides heirloom seeds. Chris doesn’t sell so-called “Survival Packs”, even though he could make some extra money at it. Instead, he recommend you start planting, anything, anywhere, and buy a book on how to save seeds. You can’t save the seeds from things your grow from Home Depot seeds or Walmart. Unless it says “heirloom” and “non-GMO” right on the package, they will be hybrid seeds that won’t grow true to the form you expect the next year. Your seed-saving will be wasted. Chris isn’t afraid we’ll have a sudden seed shortage. He suggests the big seed companies would just divert seeds from farm sales (where bulk sales profits are low) to individual buyers, where profits are higher. That might be tougher for farmers though, and then we’d all pay later? Just a note to my Canadian and overseas listeners. Many governments have regulations about what seeds can be imported. Some of the most popular American seed companies (like Mypatriotsupply.com) don’t ship to Canada at all. Others must make substantial substitutions when shipping to Canada. Make sure you know what you will get. I don’t know about rules for shipping seeds to the UK or Australia – if my listeners there know, please tell us! I need to do a whole program on seeds, the survival packs, saving your own, and the various societies like Seed Saviours, and the Seedy Saturday events put on by an outfit called “Seeds of Diversity“. You can help. Please send me your experiences, your recommendations for products or companies that worked for you. Or guests I should interview about seeds, for Radio Ecoshock. Send all tips to my email box: radio @ ecoshock.org With your help, we can do a good program on seeds. It’s fun and helpful to talk with small alternative growers around the country, and around the world. We’re going to pay a short visit to a man I’ll call the spread-sheet farmer. His new book is “The Laws of Physics Are On My Side” but he’s no physicist, with training in anthropology instead. Walter Haugen is an educated wanderer, and former field worker turned food grower. As always, I also ask Walter about how we can produce food even when the climate becomes unstable. Listeners, you can find a new paper published in February 2013 by Tufts University titled “Climate Impacts on Agriculture: A Challenge to Complacency?” It’s by Frank Ackerman and Elizabeth A. Stanton. I found that in Walter’s blog. Here is NYT blog article about this paper. This is where a surprising chapter in Walter’s book comes in handy. Walter grows so many different kinds of plants (including nut and fruit trees) that it’s hard to keep track of what is actually growing well, when it was planted, how much produce resulted, and all that. So Walter keeps careful track in a common spread sheet. Haugen learned during his university studies, direct data from the field, carefully noted, is quite important. For example, he weighs his produce every day as harvested, and notes the variety, planting time, and more. His spreadsheet revealed the farm work became more efficient in 2012. What took 2,000 hours of work in 2011 was done in just 1500 hours in 2012. As Walter says, his book is about one third analysis (including an overview of the history of agriculture) and two thirds “how to” (including really useful tips on a wide variety of specific crops). Haugen spent more than a decade as an itinerant farm worker, helping harvest American crops. Then he went back to University. So he literally offers an educated hands-on perspective that few people have. Here is the contact info you need to learn more from Walter Haugen. The web site, Walter says, is useful but fairly static. Find out more about his book here. But most of Walter’s active writing happens in the Whatcom Country Transition news. Find that here. Visit that web site and for a limited time only, hear their inspiring song “You Are Here”. We opened the program with a quick clip from their ode to beatnik Neil Cassady. We finish up with a full tune, complete with corporate angst and common folk rising. It’s called “Everything I Know”. That tune has been stuck in my brain for several days now. Thanks to all those who donated to Radio Ecoshock this week, from this blog, or from out web site! Please keep it coming, so I can keep the Radio Ecoshock coming your way. Growing food indoors is really amazing. But with the help of modern techonology, everything seems so possible. Thanks for sharing! I guess it is really a good idea to grow plants indoor under light. It is a great way to protect plants from the outside weather and insects that might damage the plants. Thanks anyway for sharing this interesting information. What the use of the amazing technology specially the Low Voltage Led Lighting, no doubt we are living in the advanced technology.